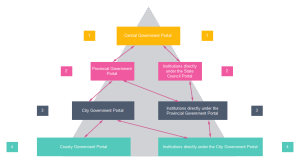 System hierarchy diagram is an effective tool in system modeling. 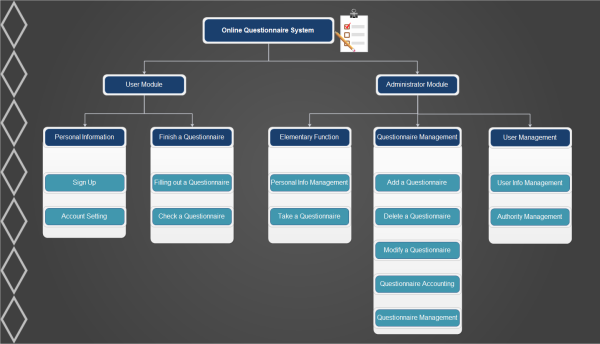 From the online questionnaire system hierarchy diagram below see how it works. Before building up a new system, a system hierarchy diagram is needed to show the allocation of classes and objects to modules in the design of a system. Now let's view the example below. A questionnaire is used to collect information from respondents who complete it. It is a very simple tool for market research, products evaluation, satisfaction surveys and for many other areas. The traditional way of doing a questionnaire is using paper and pen. But more and more people are inclined to do it on the computer because it's more effective and environmental saving. Above is an online questionnaire system model developed for researchers. As we can see, the user module allows users to sign up, set the account and fill out a questionnaire. While the administrator module allows administrators to manage on the questionnaire and collect data. Edraw offers an easy way to map any kind of system hierarchy diagram. With Edraw, you don't have to draw everything by yourself, instead, it has already included shapes that are commonly used in the software. Like this diagram above, you just drag card shapes from the symbol library, and use smart connectors to connect each part. With the Align and Distribute quick buttons, you can perfectly align and lay out the diagram. A group of nice looking themes with advanced effects make it easy to change the whole diagram style. You can finish a system hierarchy diagram like this in just few minutes. 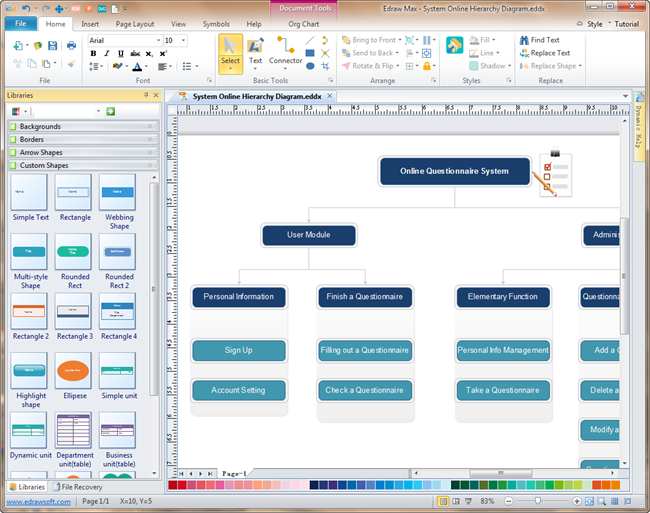 Download a free trial and see first-hand how quickly and easily you can create effective great-looking system hierarchy diagram. 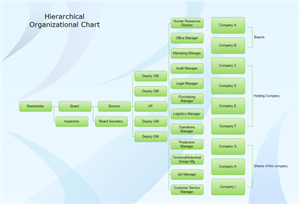 Experience the magic of our hierarchy chart software by viewing this hierarchical org chart template ready made in vector format for your own designs. Consider this example when you make your own functional hierarchy diagram. It lets you quickly finish your design work and enhance your work efficiency. 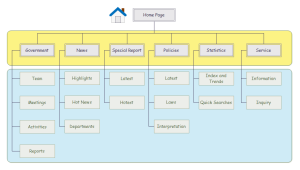 Click the picture to have a full view of the website hierarchy diagram example and download it for your own use. A simple website hierarchy structure example is presented on the right, click it to view the big picture. 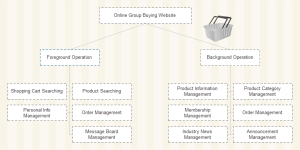 A group buying website hierarchy diagram template is ready to use in vector format for your own designs.